Mignola is back in the driver’s seat, Dave Stewart’s coloring is off the charts great, and the story itself is the perfect Hellboy blend; funny, serious, and with references to all the classics, plus some monsters getting punched in the face. At the end of the ongoing Hellboy series, Hellboy was claimed as a descendant of King Arthur and therefore rightful king of Britain. He then fought a dragon, Baba Yaga plucked out his eye, and he was killed. That’s literally all you need to know to pick up this book, and you absolutely should. It’s fitting that the perfect spot for Hellboy to have an existential crisis and some adventures is in a Hell that’s been abandoned by its demons. The opening arc of this book is a solid attention grabber, with some murders that probably shouldn’t have happened proceeding to happen. 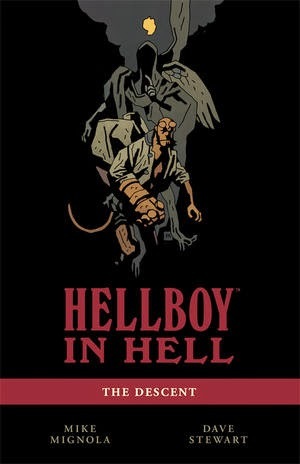 Towards the end, it moves towards single-issue stories of the like that Hellboy is renowned for; re-tellings of myths and legends, bargaining devils, wandering ghosts, that old chestnut. For a book that’s so full of decay and a sense of an ending, Mignola and company make it feel like a new beginning when it all looks like it’s going to crumble. I have to single out Dave Stewart. This guy is the literal glue holding all the titles together, and now he’s taken the flagship, flipped it on its head and makes it work. After so long coloring Hellboy in shades of fiery reds and maroons, he manages to turn Hellboy in Hell into a work of grey tones, including the titular character. The Right Hand of Doom has never looked sadder than it does when it’s cracked and greying, and that sense of tragedy permeates the whole book. In a lot of ways, this was a book that had to happen. Reading Hellboy for a lot of years, you knew he had to die, you just never knew how. Now, it’s happened, but his quest remains. He still has a Right Hand of Doom, he still has obligations which are left to our imaginations. But in a very literal sense, the sketch section at the back of the book (which is delightfully extensive) has Mignola sketches for days. He’s been doodling this book for probably five years, and we’re just now getting to peek in. I want to find flaws in Hellboy in Hell. I want to say it seems lazy, or that it’s a clichéd tactic for a writer, or that the art isn’t up to snuff, but if I said any of those things, I would be a filthy liar, and I should be stoned in a public square. This is Mignola and company at the top of their games, and I can’t wait to see how it unfolds.